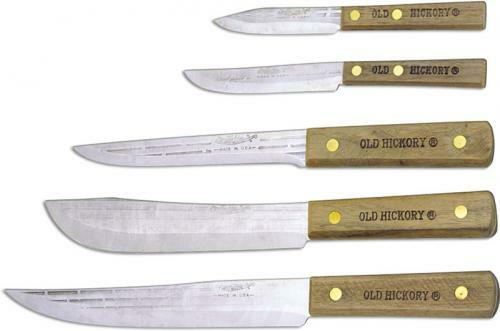 The illustrated Old Hickory Knife Set is the 5 Piece Old Hickory Cutlery Set. Each knife in this cutlery set has a fully heat treated high carbon steel blade and a brass riveted hardwood handle. The 5 Piece Old Hickory Cutlery Set includes a 3 1/4" Paring Knife with overall length of 6 7/8", a 4" Paring Knife with overall length of 7 3/4", a 6" Boning Knife with overall length of 10 3/4", a 7" Butcher Knife with overall length of 11 3/4" and an 8" Slicer with overall length of 12 3/4". Made in the USA. Got the 5 piece kitchen set. I was so sick of sharpening my wife's stainless steel knives that would never hold an edge. I grew up with a carbon steel kitchen knives which always stayed sharp. I learned at a young age that more cut fingers are caused by trying to use a dull knife than a sharp one. I am very happy with the Old Hickory kitchen knives, even though you must make sure they are dry before being put away. Thank you Knives Plus! Superior to all kitchen and utility knives I've ever used. Easy to sharpen, stay sharp. Just dry them good after rinsing them off. As advertised. Good balance and great blades for the money. Hard to find high carbon steel kitchen knives for a reasonable price.